Smoke Pressure System Market size was valued at over USD 400 million in 2017 and will grow at over 5% CAGR from 2018 to 2024. Growing utilization of pressurization systems in newly constructed as well as existing infrastructures due to the increasing instances of fire accidents is accelerating the smoke pressure system market growth. The rise in residential construction, non-residential buildings, and government construction projects is providing significant opportunities to the industry. Following a six-year downturn, the construction spending rose to two percent in 2017 in Europe. The constantly-growing population in the region has resulted in increased investments in the infrastructure development sector. Rapid urbanization in the country demands a faster construction of buildings and facilities for the rising population with advanced fire safety measures which contributes to the stairwell pressurization system market growth. Rise in the adoption of online & mobile computing services and the growing usage of social media and need for cloud storage have led to a rise in the number of data centers globally. Data centers are being used across all verticals such as manufacturing, IT & telecom, utility, healthcare, energy, and BFSI. The high sensitivity and value of the electronic equipment found in modern data centers coupled with the consequences of system interruption make fire protection a critical component of data center risk assessment. Fire and smoke can damage the data centers, which may lead to the loss of important information, owing to which several data center facilities are installing smoke pressure system on their premises, contributing to the smoke pressure system market growth. The design and testing of these systems in skyscrapers & high-rise buildings is posing significant challenges to the stairwell pressurization system market growth. To properly design the systems in skyscrapers and tall buildings, the vertical movement of air through an infrastructure caused by the temperature difference between the ambient outside air and building air, also known as stack effect must be evaluated. In addition, testing stair & elevator pressurization systems within the code specified pressure differential limits can be challenging particularly for high-rise structures, hindering the industry growth. 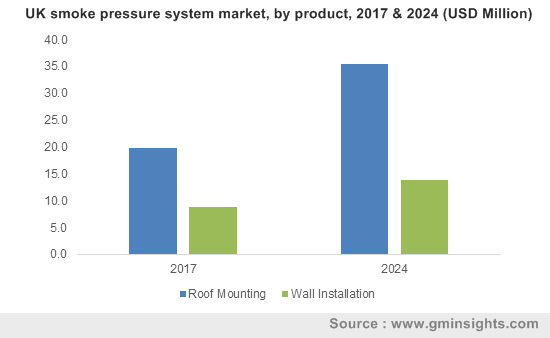 In the stairwell pressurization system market, roof mounted solutions are expected to grow at a CAGR of over 6% from 2018 to 2024. A stairwell can be pressurized with a single-roof mounted propeller system due to its enhanced capability of smoke control. The pressurization unit can be located anywhere, however the entry or exit doors at the ground level remain open during emergencies, the top locations are usually preferred to prevent the short-circuiting of air. For high-rise buildings, the preferred distribution arrangement is a vertical duct that runs adjacent to the pressurized spaces. Distribution can be achieved by a single fan serving a vertical duct with horizontal branches to every floor or multiple plants that serve multiple floors. Supply air fan unit accounted for more than 50% share of the stairwell pressurization system market in 2017. Low installation cost coupled with the ease-of-use provided by this equipment will propel the industry demand over the future. In addition, the presence of stringent regulations, standards, and certification demands that assure end users of the reliability of these solutions has provided the potential for the growth of the stairwell pressurization system market. This equipment is positioned to avoid toxic gases and smoke entering the stairs, especially when located at high levels. The U.S. smoke pressure system market is expected to grow at over 7% CAGR over the forecast timespan. Growing construction sector coupled with the stable economic conditions in the region is favoring the construction of technologically-advanced buildings with the latest fire safety measures. In the U.S., the design of smoke control systems for infrastructures takes place in accordance with the NFPA 92 Standard for Smoke Control Systems. According to the NFPA, the U.S. fire department responded to an average of 358,500 home structure fires (estimated) per year during 2011-2015. The rising cases of fire accidents reported in the country have led to an increased demand for reliable and technologically-advanced smoke pressure system, thereby contributing to the stairwell pressurization system market growth. 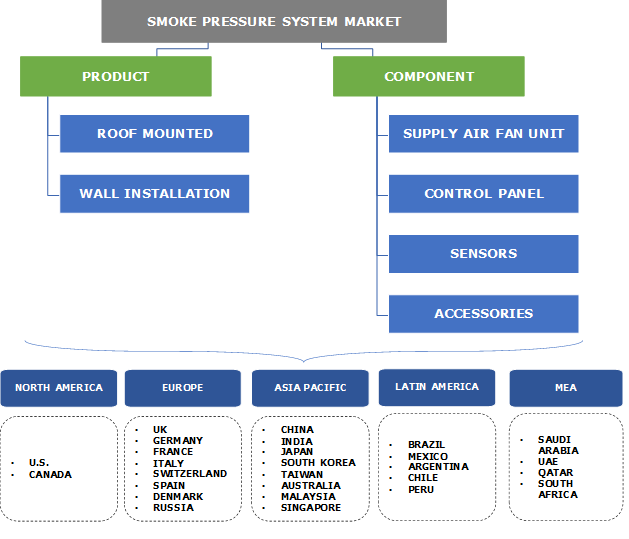 Companies operating in the smoke pressure system market include Systemair AB, FlaktGroup, Colt International Ltd., Greenheck Fan Corporation, Sodeca SLU, Nuaire, Aldes Aeraulique S.A., NOVENCO Building & Industry, Essmann Group, GSBmbh, Air Pressure Solution, and Strulik GmbH. The stairwell pressurization system market is consolidated in nature due to the presence of a fewer number of players in the marketplace. The players are heavily investing on the R&D to provide technologically-advanced systems in compliance with the stringent regulations & standards, as a measure to sustain in the industry. The industry is characterized by the increasing competition among the existing industry players. The industry is consolidated owing to the fewer number of companies holding a large amount of market share. Large industry participants operating in the market possess high purchasing capacity and can offer users with a range of systems and other services. The presence of stringent regulations, standards, and various certifications poses high entry barriers to new industry participants. Modern infrastructures must comply with the stringent requirements regarding the safety level in case of fire. The surge in demand to offer smoke-free escape routes during a fire scenario with the use of pressurization systems is anticipated to provide an impetus to the stairwell pressurization system market demand.